Trip To Indonesia Trip To Indonesia Trip To Nature Waterfall Have You Heard 9 Beautiful Waterfalls In Bali Island?, Check It Out! Have You Heard 9 Beautiful Waterfalls In Bali Island?, Check It Out! When we talk about Bali Island, the first thing we imagine must be the natural beauty of this island, especially the beaches that are very beautiful. Apparently, in addition to having beautiful beaches, Bali Island also has several waterfalls that are not less beautiful. 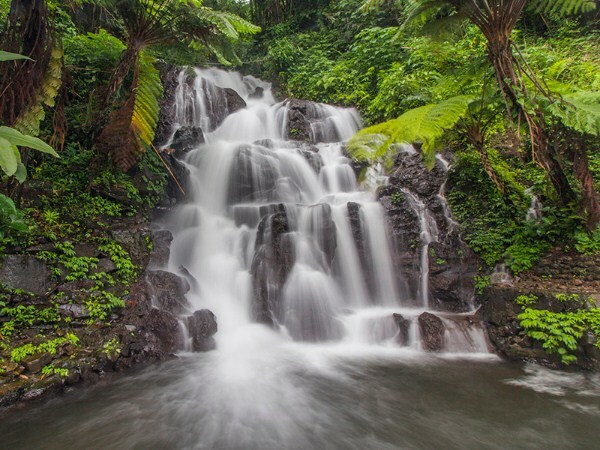 For those of you who like to explore the nature, waterfalls in Bali is very suitable for you to visit. However, you should prepare a healthy physique, as well as wear comfortable clothes and shoes. Because you are required to descend hundreds of stairs before you can enjoy the beauty of waterfalls in Bali. 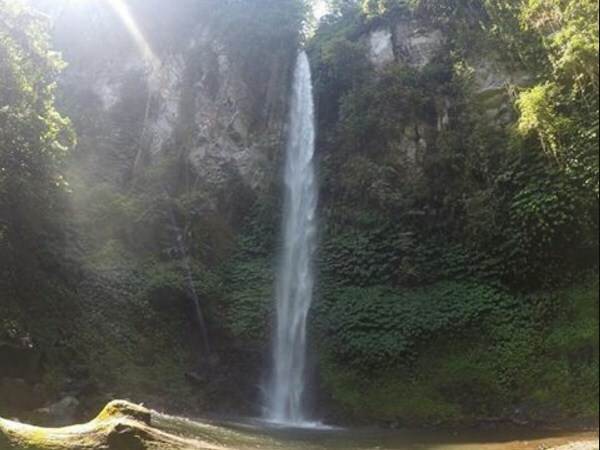 Kembar Gitgit waterfall is located in the Gunung Luwih Gitgit Village, Sukasada District, Buleleng, Bali. This waterfall is also called Campuhan Waterfall. In the Balinese language, Campuhan means 'meeting two streams of water'. And according to the name, Kembar Gitgit Waterfall or Campuhan Waterfall, are two waterfalls that have a close position, and the water has met each other. Uniquely, these two waterfalls have different of water temperatures. Kembar Gitgit Waterfall is believed to be the source of holy water. Therefore, here are often held ceremonial cleansing, as well as other religious rituals. 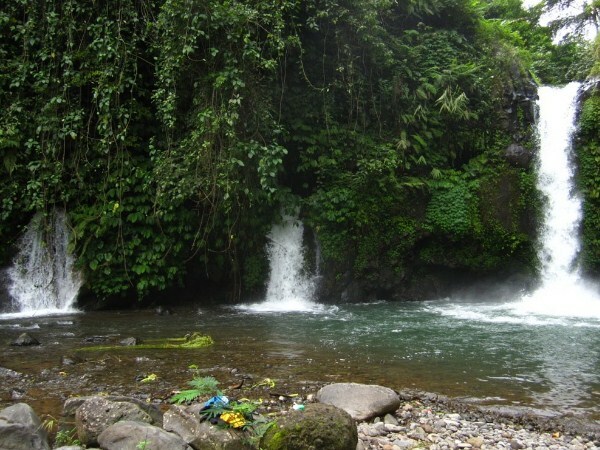 Lemukih Waterfall is located in Lemukih Village, Sawan District, Buleleng, Bali. Lemukih Waterfall is a triple waterfall. Under the highest waterfall (as you can see in the picture), there is a pool that you can use to playing water. 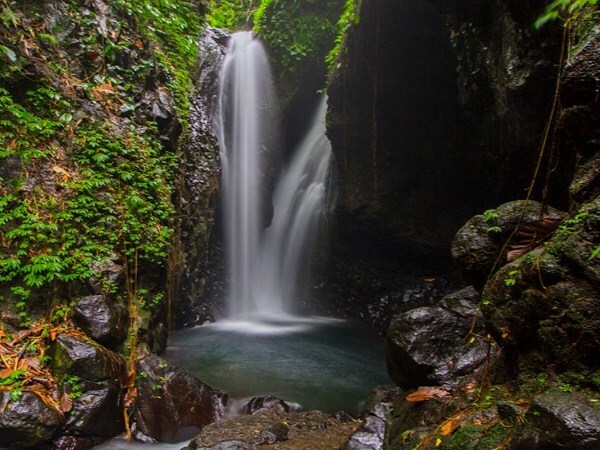 Juwuk Manis Waterfall is located in Manggissari Village, Pekutatan District, Jembrana, Bali. 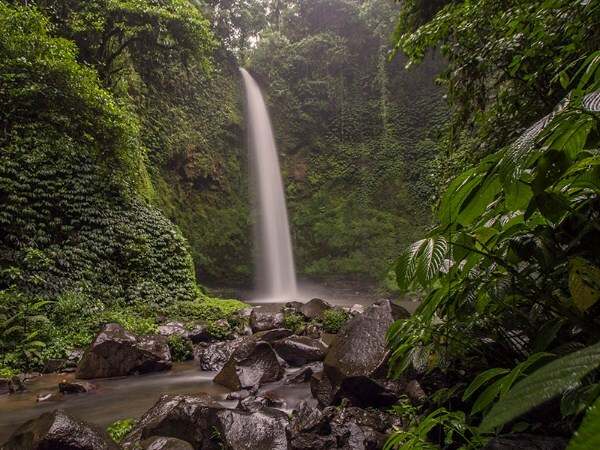 Juwuk Manis Waterfall is worthy of the title, as one of the most beautiful waterfalls in Bali. To reach the Juwuk Manis Waterfall, it takes a lot of struggle. That's because, you have to walk the steep path, and past coffee and clove plantation. 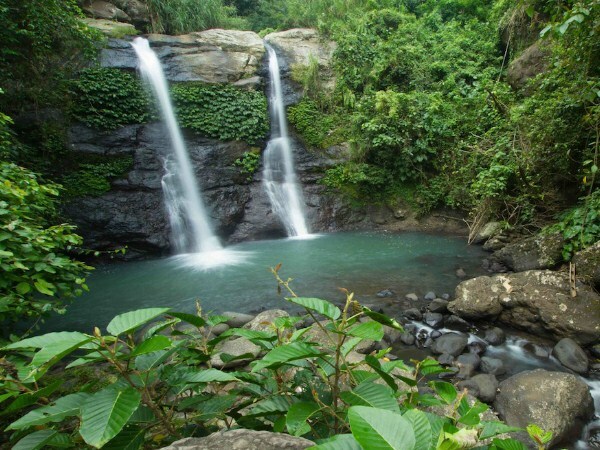 Nungnung Waterfall is located in Plaga Village, Petang District, Badung, Bali. Nungnung Waterfall has a height of about 50 meters and it's located at an altitude of 900 meters above sea level. To reach Nungnung Waterfall, you have to down hundreds of stairs are quite steep, and also quite slippery especially when it rains. Near Nungnung Waterfall, you can see Tukad Bangkung Bridge, which is the longest bridge in Bali. 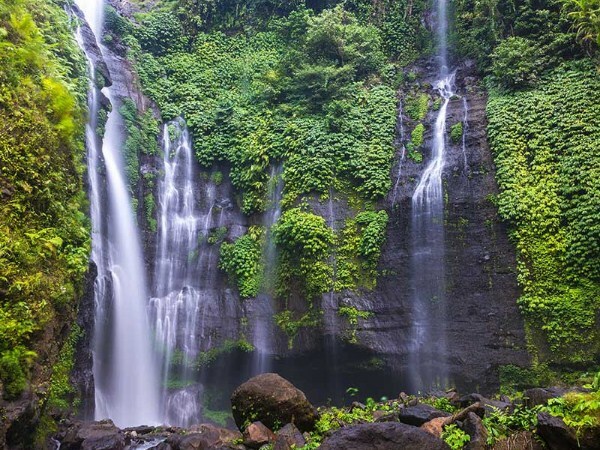 Sekumpul Waterfall is located in Sekumpul Village, Sawan District, Buleleng, Bali. Its location is quite hidden in the forest of Buleleng. At this location, there are at least 7 waterfalls. The 7 waterfalls, spread over several high cliffs and surrounded by green trees. The average height of the waterfall is about 80 meters. To get to Sekumpul Waterfall, requires a bit of sacrifice and struggle, because you have to descend hundreds of stairs. 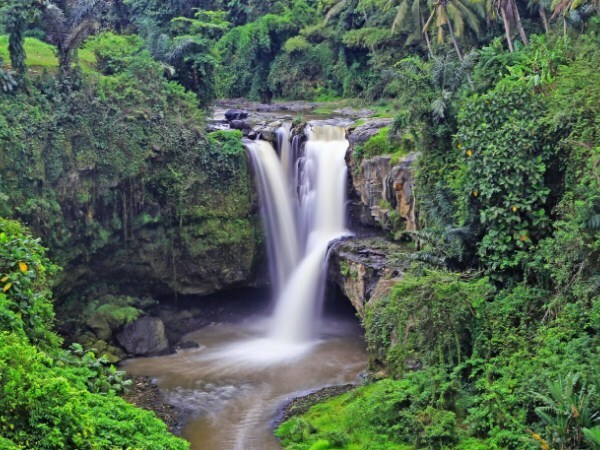 Tegenungan Waterfall is located in Kemenuh Village, Sukawati District, Gianyar, Bali. Tegenungan Waterfall is quite unique. Because, although has a height of about only 4 meters, but the water discharge is very heavy, and the surrounding scenery is still very beautiful. To get to Tegenungan Waterfall, you need to descend hundreds of stairs, and along the banks of the Tukad Petanu River. Yeh Mampeh Waterfall or also known as Singaraja Waterfall is located in Les Village, Teja Kula Singaraja District, Singaraja, Bali. Yeh Mampeh in Indonesian means 'flying water'. The name is given because the waterfall is high enough that is about 30 meters, so when the water is felt, it looks like flying before touching the base of the waterfall. To reach Yeh Mampeh Waterfall, firstly, you must walk through the hills and countryside. Blemantung Waterfall is located in Pupuan Village, Pupuan District, Tabanan, Bali. Blemantung Waterfall has a height of about 50 meters and has a beautiful natural atmosphere. There is no other building than a temple and a gazebo in this place. To reach Blemantung Waterfall, you have to walk about 400 meters away, through the path between the coffee plantations. 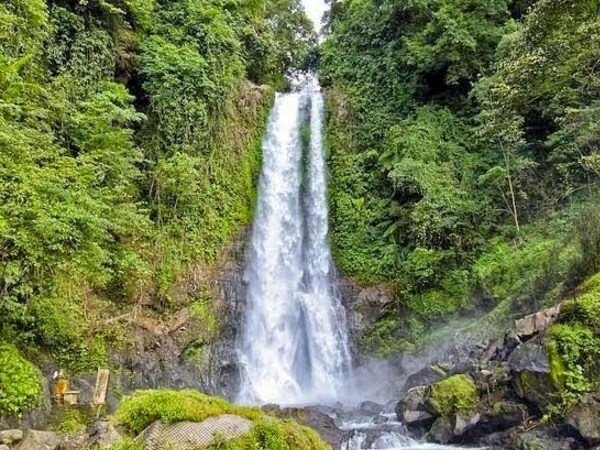 Jembong Waterfall is located in Ambengan Village, Sukasada District, Buleleng, Bali. This waterfall has a uniqueness, because the place is on a sloping plain, with a slope of more than 75 degrees. Under the waterfall, there is a pool, which you can use to playing water. Jembong Waterfall is in the middle of a chocolate plantation. To reach Jembong Waterfall, you have to pass a slightly rocky path, in the middle of a chocolate plantation. The 9 most beautiful waterfalls on the island of Bali, is perfect for you who are on vacation to this island, and want some different attractions. Remember !, always keep the cleanliness and beauty of the tourist objects that you have visited, especially natural-themed attractions.